All hail the rebirth of the Laurentide Ice Sheet! Brrr! It's cold here in Redding, but nothing like that. 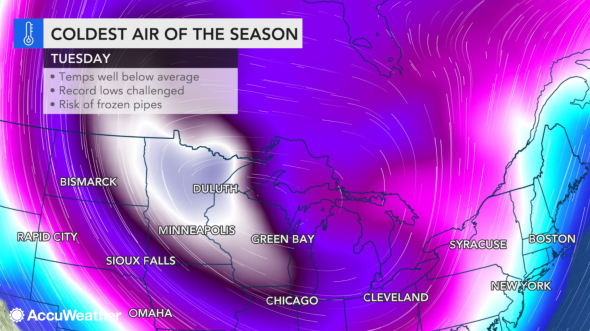 On the other hand, it is January - the depths of Winter - so brutal cold shouldn't be a total surprise. The sun is going to sleep and the Followers of AlGore (known collectively as Gorons) are getting desperate to get their scam codified and set in stone. Hopefully they will stay in the UN Building long enough for the ice to trap them for good. I live in the wilds of Eastern South Dakota and it has sure been complaining-assed cold here and it's going get worse... Alabama is looking better and better for this old fart. Come spring and I am moving. I have some relatives who left maine and went to tampa because winter. I figured six months. heat and humidity was not their forte. they had a pool and excellent air conditioning so it took a year and a half. so, then what? New Hampshire. imagine that. at least they didn't get to vermont. If they had gone to vermont, I would not be able to visit. vermont is only useful as a place to lay pavement over. and maple syrup. thats about all. Bring it! Over half of the population in my area (SW Mi) panic at 2ft. drifts. We need an old fashioned blizzard to put a bit of seasoning on the snowflakes. On par with 77-78 winter would do. Or '67 for that matter. I'll keep myself in Missouri thank you. Humid as hell in the summer and can get damn cold sometimes but not always real extreme. Like they say...don't like Missouri weather....wait 30 minutes...it'll change. Bout right too.